I was the surprised and delighted recipient of a gift of Random Act of Kindness which arrived in yesterday's mail. 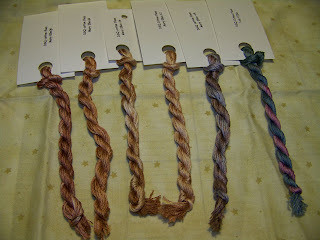 Pat Winter gifted me with this lovely package of her hand-dyed ribbons. I love her ribbons and had actually asked to be on her list the next time she dyed them, and she sent me this wonderful package yesterday, smelling wonderfully of lavender. Thank you so much Pat, you brightened my day with your generous gift! The room redo is coming along pretty quickly now. John got the second cabinet up, installed lights underneath the cabinets, got one of the base cabinets done, and is working on the other one now. In addition to having 3 drawers the bottom one has a pull out section too, like a cutting board. 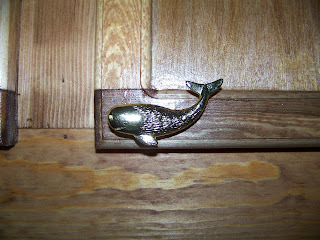 These are a detail of the whale handles I ordered. box back up on the wall. And my little trinket shelf back up. 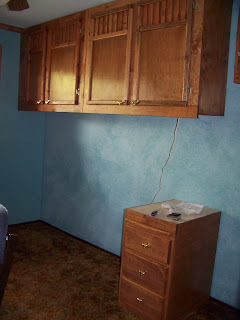 Today John and I are going over to Home Depot to purchase the counter top. I have a couple of other packages I got yesterday to share, one the Birds and Bees RR from Debbie Smith, but I need to get back to work now, so will do that tomorrow. 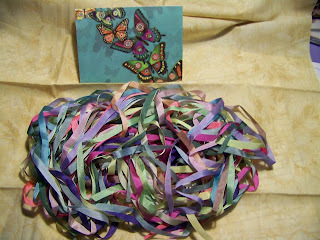 Cathy, is having a giveway for her 100th post here of a bunch of CQ goodies. As mentioned previously, I joined a 2nd CQ RR. This one is DYB UTS, (Do Your Own Block, Under the Sea). 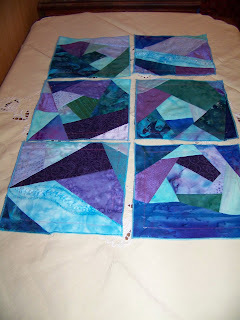 This one consists of each person embellishing the complete block. These are 6 inch blocks. When they get home, I should have 1 to embellish myself. I am thinking this will be a long piece that I can hang over the doorway to my newly painted office/craft area. These will fit the color scheme perfectly. Friday I ran up to JoAnns and got a bunch of pieces for this RR in fancy fabrics (just 1/4 yards). But then I got home and ended up getting my batiks out instead. 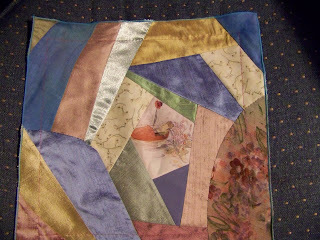 I am starting 2 new CQ round robins this month on CQI (Crazy Quilting International). The first of these is this one, the Birds and Bees. I thought this would be a perfect one to have a little frog in. Our youngest daughter, Katie's 30th birthday is this year, in August. She has always loved frogs.I should get this back in time to either frame it, or make it into a wall-hanging or cushion for her birthday. I am again working with my buddies Moira, Susan, Gail, and Candi on another round of a CQ RR. 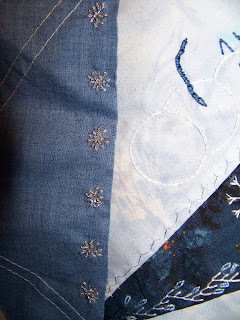 This month I was working on Gail's table runner that is for her daughter. 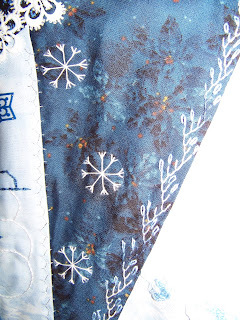 Her daughter is having a new color scheme for Christmas, blues, silvers and crystal with a theme of snowmen and snowflakes. 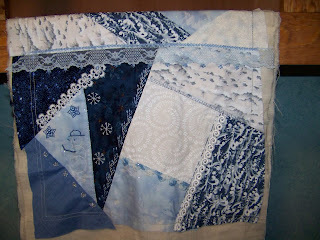 I did a couple of snowflakes on this section. This was the whole section I worked on. cabinets are up. John has the doors for this section section ready to be polyurethaned today. countertop is going to sit on. I still need to get stuff back in the bookcase by the window, but probably not today. I have a couple of round robin blocks I need to put together today to ship out by the end of the week. 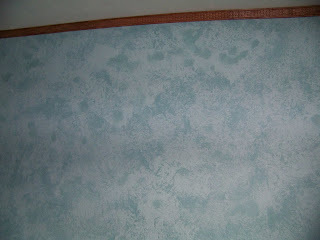 This is the wall my desk faces all finished painted with my basketweave molding installed. I love it! Wishing you all a great Valentine's day. I have recently had a couple of great mail days, from shopping on my favorite Etsy shops. Winter had made and was offering in her Etsy shop as soon as I saw it on her blog, and waited anxiously for her to list it in her Etsy shop. The pin is gorgeous and Pat also included some of her hand-dyed silk ribbons and a silkie. Another Etsy shop I love is Susan's. I recently received more of her DSQ threads. 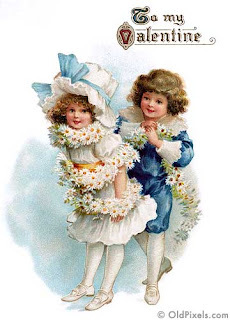 I bought some of the Mary Ellen line which was named after my maternal grandmother, and also 1 of the Lois line that was named after Pat Winter's mother. These threads are beautiful and lovely to work with. The third Etsy shop I always love to shop at is at Gypsy Feather. 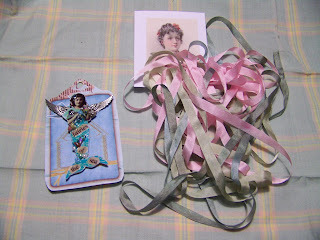 She offers the loveliest collection of vintage laces, buttons, bits of this and that. I love getting her packages! Don't have a picture of my latest find. My sewing room is a mess. 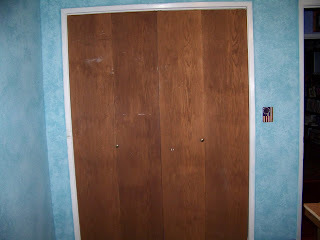 My painting in my office/craft room is done, except for a bit of trim around the doors. Today hopefully John will be putting up the molding, and I can move my desk back where it belongs, instead of the middle of the room. Then I will be able to put the books back on the bookshelf, and gain control of my sewing room again! 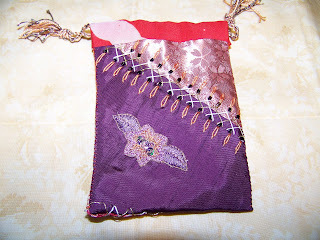 I recently entered Hideko's giveaway on her blog and won one of her lovely CQ jewelry pouches. Mine arrived yesterday and I am thrilled. What an excellent mail day! The pouch is just beautiful on both sides! 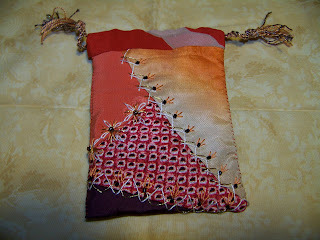 Thank you so much Hideko I am truly thankful to have won your lovely jewelry pouch! 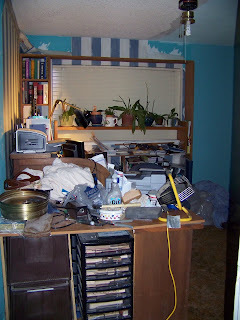 I have been making slow progress on my craft room/office redo. My progress is hampered if I have a long, long day at work. But it is coming along. This is the wall that will have cabinets and counters. I painted a base coat of Turquoise Sea, and yesterday I did a rag-faux painting glaze of Spaqua. 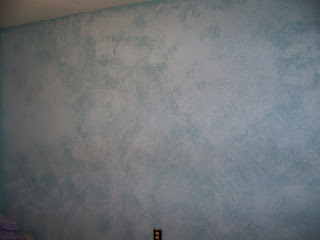 I really like this wall, although by this photo it is not a true representation of the color. This is more of the true color. 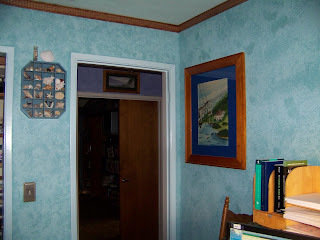 This wall by the closet and the doorway I don't like too much and am thinking about repainting the base coat, and re-faux painting it. I couldn't get the rag roller around on these small areas, and I don't like the way it came out. So unless I change my mind by noon when I should get off work today, I am redoing this wall. The red, white and blue switchplate don't stay. I just forgot to pick up a new brass one yesterday when I was at Lowe's. My office section doesn't normally look like this. When I took stuff off the big bookcase, I stacked things on this other one by the window, and this stuff in front of my desk has pieces of the ceiling fan, light and my various painting things, and John brought in a light from the garage so I could see what I am doing. Next I need to move all this stuff away from the window, and my rolltop desk on the other side of the room, so I can get the rest of the wallpaper off, and the last 1/4 area of popcorn ceiling off s I can finish up the ceiling and get light and fan put back together. But I am antsy to get all this stuff moved. 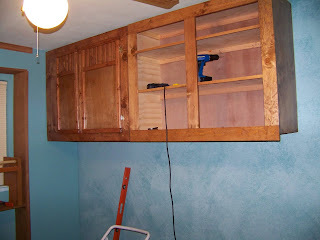 John has almost completed 1 of the cabinets that is going to go on the blank wall, and he is staining it cherry. 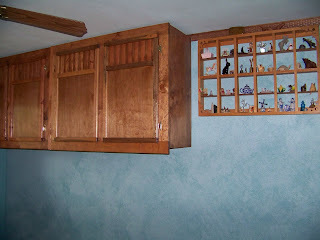 Plus yesterday while we were at Lowe's we got the neatest molding, it is like a basketweave (one of my loves, baskets). Lisa has created a countdown to Valentine’s Day with a new printable image sheet each day. In her words , "Each day from February 1st through Valentine’s Day, one numbered heart with a link to that day’s surprise will appear. " In her words: "Please note that these images are offered as LINKWARE. Before you download images, you must post a link to this page to your web site or blog, or include the link in a post to an online art group or message board. Once you have posted the link, feel free to download to your heart’s content."